WW1 was used for the internment of enemy aliens. 1916. Private Smith celebrated his eighteenth birthday while on the troopsship to England. 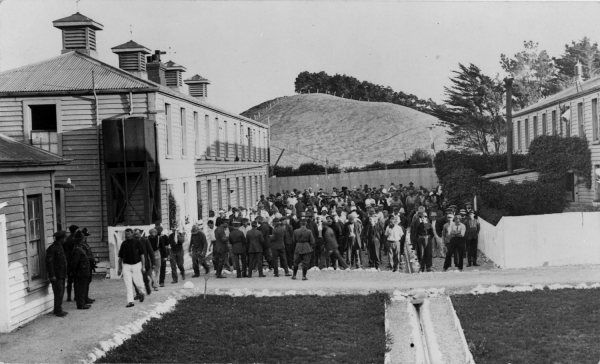 On arrival in England the 16th Reinforcements were moved to Sling Camp on 25th October 1916 and Private Smith was attached C Company, 3rd Reserve Battalion NZ(R)B as Rifleman Smith. to the north of the River Douve and the south east of Messines. General Hospital at Brockenhurst, England. ​Rifleman Smith remained at Brockenhurst until 10th October 1917 when he was transferred to the NZ Convalescent Hospital, Hornchurch. Rifleman Smith on 20th October 1917 was then posted to the NZ Codford Depot and taken on as staff at the depot. Rifleman Smith remained at Codford for the rest of his service eventually leaving England on 21st January 1919. 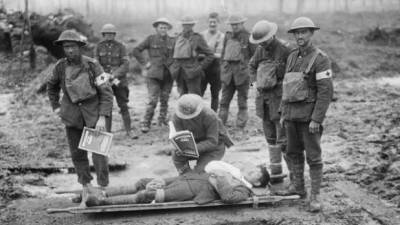 Rifleman Smith was medically assessed on the return journey to New Zealand, the impact of two bouts of influenza where noted and he was granted extended leave on his return to New Zealand. Camp. On 29th December 1919 Private Smith was posted to the Trentham Military Camp, on 21st January 1920 he requested a discharged from the army[vi]. Terry married on 26th July 1920 Sarah Jane Steward the couple raise six children[vii]. 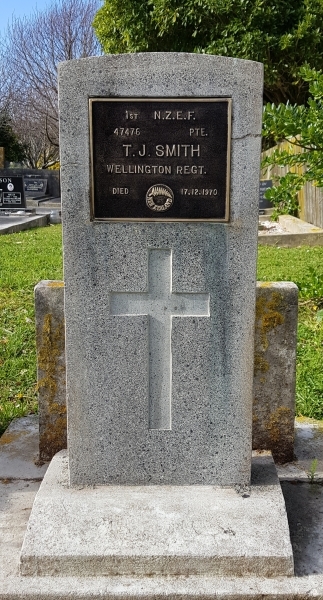 It is probable that Sarah Jane Smith died in 1944 as Terry (Thomas) is listed as not leaving a widow on 17th December 1970 when he died in Titahi Bay. was living with, potentially his oldest daughter. the correct regimental number and regiment will be fitted to the grave.